Cladophora sp. (often called Clado) is an aquascaper's worst nightmare. It's very branchy and often forms tangles of thin strands, making fluffy "clouds." It also as a pungent musty odor and is fairly brittle. It spreads via tiny strands which break off when disturbed, then anchor in plants (particularly plants like moss, grasses, and ferns that collect a lot of debris). 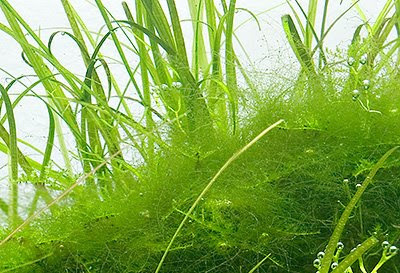 It is often confused with Hair Algae, which is, well, more like hair growing on fixed surfaces. Unlike other algae, cladophora is more like a plant, so it thrives when your plants thrive. It also isn't spread by airborne spores, but direct transmission from tank to tank. Most often, it is introduced via a new plant or contaminated equipment. The filaments can be very small (smaller than a hair) and can easily be missed in a clump of roots or stems. 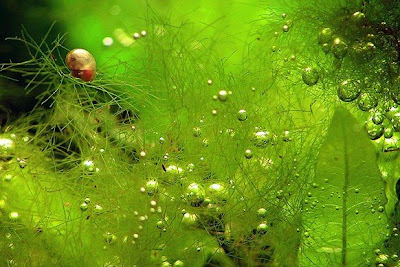 Some claim that Marimo moss balls, which are a form of Cladophora, can cause it, but I remain a bit skeptical that they can change form so dramatically. The best way to prevent cladophora is to clean all new plants and anything you put in your tank that may be contaminated with tiny strands of Cladophora. Rinsing won't get rid of Cladophora, as it is often tangled in roots, leaves, or stems. The best way is to do a quick bleach dip. Preventing this nuisance algae from getting into your tank is by far the best way to ensure you never have to deal with the labors of removing it. An ounce of prevention is worth a pound of cure. If you already have a bad case of Cladophora algae in your aquarium, you'll need some luck, and a toothbrush. Start by manually removing as much as you can with your fingers, trying to minimize the amount that gets set free floating into the water by being gentle. Then use the toothbrush to "comb" out any remaining strands, twirling the toothbrush to wrap the algae around the brush. Remove as much as you can. Manual removal is really the best option. Repeat often (every few days). There are no known algae eaters that will touch this stuff. I also found that reducing the lighting levels helped. The slower the plants grow, the slower the Cladophora grows, and the easier it is to manually remove. Generally it seems that at lower light levels, plants can outcompete the Cladophora. However, blackouts don't seem to work at all. The worst is when it gets into moss. There's almost nothing you can do but throw out the moss. Flourish Excel overdosing is also rumored to work, but I found that all this did for me was make the Cladophora more brittle. Try it out, but it doesn't seem to be a miracle cure. This might sound silly, but it is possible to live with it - especially in mosses. I had cladophora in my tank tangled up in Java moss. I never got it completely out but removed what I could while cleaning each week. That kept it under control and it never spread beyond the moss. And in the moss, in moderate amounts it doesn't look bad. It is far less of an eyesore than most other algae as t looks almost like a moss itself. Yes! This algae has been in my favorite planted tank for ages, and I was having trouble finding information about it online! I have recently tried the Flourish Excel trick and it worked for me. 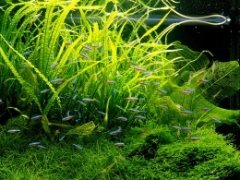 I didn't overdose, I used the amount recommended, and in about week the algae was under control. Not gone, but the huge growths coming out of the filter, and the layer across the substrate that was choking everything else have been *significantly* reduced. I removed as much as I could, did a large water change, and dosed the tank. It is wonderful to see the substrate again, and know that the other plants I have in there have a chance to thrive now! I have read on the Internet that no algae eater or other cleaning crew animal will affect Cladophora. Well, I had a HUGE cladophora problem, ruined my hairgrass and was all over the place. I started a colony of Cherry Shrimp and got ahold of 3 true true Siamese Algae Eaters (crossocheilus langei). I had no intent that they would eat the cladophora. At first I noticed that the shrimps were all over it all the time especially the young. The SAEs were in it like crazy too. Now it's almost GONE. Perhaps something else is at work, although I made no changes to my tank. How do you differentiate between spirogyra and Cladophora? 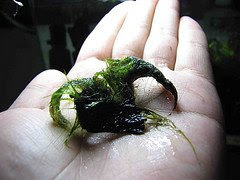 From my experience, black molly eat this cladophora algae especially the new growth one. Manual removal for growth algae combined with black mollies will get rid of the algae from your tank.